This first video, about 1/2 hour long, has a recurring graph in it where they, item by item, put on it things that limit human comfort and habitation inside a rotating structure. In the end, you are left with a stripe of radius vs rotation rate where people would be OK. In other words, it answers things like what size your space station must be to “work”. I wish the low end of the graph was a bit more precise, but interpolating it looks like about 25 M is near the lower bound. So somewhere between 75 and 100 feet. The London Eye is a cantilevered observation wheel on the South Bank of the River Thames in London. It is Europe’s tallest cantilevered observation wheel, is the most popular paid tourist attraction in the United Kingdom with over 3.75 million visitors annually, and has made many appearances in popular culture. The structure is 135 metres (443 ft) tall and the wheel has a diameter of 120 metres (394 ft). When it opened to the public in 2000 it was the world’s tallest Ferris wheel. Its height was surpassed by the 525-foot (160 m) Star of Nanchang in 2006, the 165 metres (541 ft) Singapore Flyer in 2008, and the 550-foot tall (167.6 m) High Roller (Las Vegas) in 2014. Supported by an A-frame on one side only, unlike the taller Nanchang and Singapore wheels, the Eye is described by its operators as “the world’s tallest cantilevered observation wheel”. This is a segmented spaceport that will be revenue generating at each major stage of completion. This will be mankinds first space station with artificial gravity. You could call it a destination hotel, a low Earth orbit cruise ship, or a city in space with a spaceport. But the best way to understand this complex piece of infrastructure is to look to its namesake: The Gateway. A very startling turn of events, and I first ran into it in this video (17 minutes). It seems that The Brexit Party now TOPS the most recent poll for European Elections. Ahead of Labor. Ahead of Conservatives. Then, in Canada, the people in Alberta didn’t buy into the smear campaign and have told NDP to knock it off via electing UCP ( United Conservatives with 63 seats, NDP 24) so change coming to Canada too. Watch for Alberta to “have words” with Ottawa. I’d add some links / quotes from text sources (news papers et. al.) but it’s after 4 AM, I’ve been working all night on some tech stuff after most of a week of graphs and temperature data, and I just need to get this up and go get some sleep… So maybe tomorrow I’ll add some in comments. In prior postings I did a sample of various countries around the world, and a full set of South America and Antarctica. This extends that set with North America. 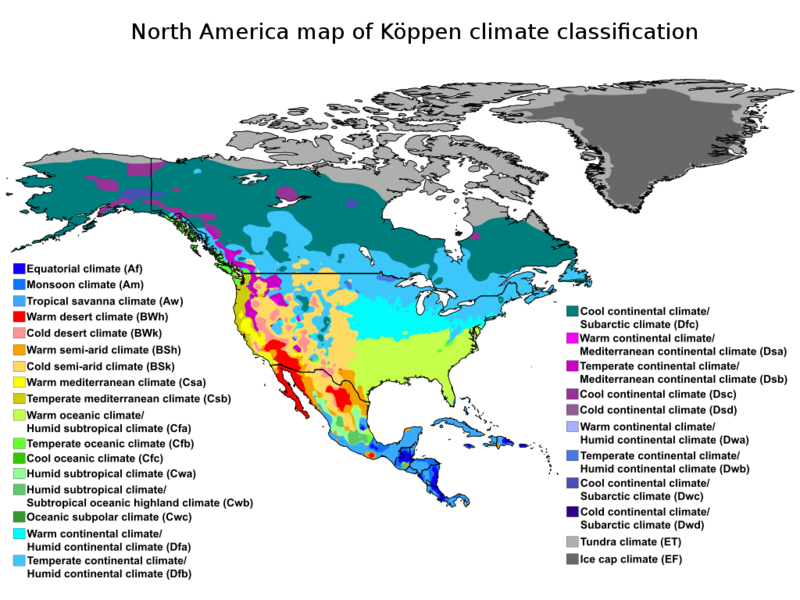 Here’s the Koppen Climate graph for North America so you have something for comparison. These are all in one large shallow water basin with common weather. They ought to be nearly identical. Not a lot of change in the data. They seem to have cooled since 1980 (see graph below) and were hotter back around 1880 – 1860. About 1/2 of recent data warmed about 1/2 C, and a cool dip about 1940-1980; but now about the same as the mid 1800s. Cyclical changes? Drop the past about 0.4 C and warm the recent about 1/4 C – Presto! a trend! Except that those pesky 1800s look about the same as now. Better use that cold snap from 1940 to 1980 as the “baseline period” and ony measure warming against it. Again with cooling the past a bit. But from 1990 to date is basically flat. Ought not the “warming from CO2” be more now and less in 1970? Dominica has no data in v3.3, so all we get is the v4 anomaly graph. So they had a crazy high 2 C “warming” rate, chop 1 C out of it and get a more respectable 1 C rate. Or is there just 1.5 C of “random” in temperature measuring on islands? Again with 2 C of warming, so chop a degree C out of some of it, yet the most recent data points (see below graph) are below normal. But that’s just weather, right? A whopping 5 C range of temperatures, but currently about the same as 1940. Natural variability or error band, one of the other, is way higher than that 1/2 C of Project Fear Warming. Looks like nobody fooled with the temperatures between versions. Guess a major hurricane will stop that kind of thing for a while. Anomaly graph below is rather flat too. Had a rise in to 1960, then was ignored for about 20 years, and now the temperatures are like “1940 all over again”. Push up the 40s (outside the baseline interval) a 1/2 C and drop the baseline spots about 1/2 C but with some noise in it, then lift the very recent by about 1/2 C. I think we’ve seen that before. Per the anomaly graph below, Jamaica has warmed about 3 C. All that without setting regular record temperatures and with nearby islands not having the same rise. Airport tarmac anyone? Didn’t Jamaica have a big pop in tourism with the whole Bob Marley / Reggae thing? I know I went. Locals were complaining about added traffic, all the airplanes and hotels… I note in passing the hot late 1800s highs are about the same as now. Differences look like about 1 C range of random. Anomaly trend looks like it was cold in the ’60s and recovered. A nice 1/4 C or so cooling of the past, and another 1/4 C to 1/2 C warming of the recent data, pretty soon you got yourself a trend. Except now is about the same as 1980. Kinda makes you wonder why it is in the inventory at all. Nice gentle almost unnoticed 1/4 C cooling of the past, a narrow “dip” in the baseline interval. All in all, nicely done sculpting. Saint Vincent & The Grenadines have no data in version v3.3. WOW, that 2 C of change down in the “baseline interval” is about the same as the dip in the anomaly graph then… Without that 2 C of down, Trinidad & Tobago would look sort of flat; with “now” temps about the same as the 1920-1930 temps. Sure doesn’t look like warming to me. Given some islands flat, and some with 3 C of warming, I think we’re looking at land use issues, thermometer location, or error bands / data fudging. Gee, that recent rise at the tail of the anomaly data (below) seems to match in shape the rise in the difference graph (above). Not really warming though we lose some of the low going anomalies in recent data (see graph below) and the changes between v3.3 and v4 are not much. Looks like nobody is paying attention to Guatemala. Looking at the anomaly plot below, there’s a nice “dip” in the baseline interval, and a gap about 1990-2005, but then some crazy changes in the above difference graph. Looks to me like +/- 1 C of error band and nobody really knowing just what the temperature is in tenths of C.
Already has a nice “dip” in the baseline interval, but those changes in the recent time are just wild. We have 1/2 C drop added to the baseline, and 1 C of rise added in recent data. Just about the same as the “warming” found. Looks like someone found a way to get Nicaragua data in line with goals. Nice dip in the baseline interval, but what’s this with the cooing at the end? Costa Rica just not getting hot? And right next to Nicaragua too. Ought to be nearly identical, but isn’t. Gee.. Looks to me like Panama is being flat to slightly cooling (see below) and not much change at all between v3.3 and v4. I wonder if this is at a US Military Base and they are grumpy if you play with their data? I wonder if that’s why it cuts off in 1980… Seems to me someone ought to know the temperature in Panama right now. The specifics on the report / graph making programs is in the first “by country” posting so will not be repeated here. So there you have it. A few days of “seat time” at the computer. Hopefully it is of use to someone. I think it does point out what country’s data needs more scrutiny. Then there’s also the question of why trends in some nations are different from another very nearby and in the same body of water. Furthermore, there’s a great “cross check” for this in that there is surface water temperature data from decades of hurricane tracking. On these small islands, air temperature never strays far from water temperature. I was swimming in Jamaica once when rain started. The ocean, air, and rain all at 86 F.
It does look like there was a cyclical “dip” after the hot 1930s-40s into a cool ’50s-70s and we have newspaper and magazine articles from then shouting about a New Little Ice Age (and I personally remember it – IT Happened.) So despite the folks saying that picking it for a “baseline” doesn’t matter, I think it’s just too convenient. The method I used to calculate anomaly has no baseline. A given thermometer is only compared to itself over a selected month across the years. (So, for example, the Jamaica Airport thermometer would have all of its Januaries averaged then the January anomaly computed against that. Repeat for each other month of the year for each instrument.) Then there is just the shortness of most records. Many just start in that cold period and rise out of it, not having an old 1870 hot sample to see in their past. Finally, with that much change showing up in some very small countries, you know they didn’t have a dozen thermometers to choose from in 1890. It must be some kind of “intervention” when decades of data all move by the same amount. It just screams “Fudging the data” (though I’m sure they would call it fixing errors in the past). But when all the “warming” comes from the “fixing up” and “adjusting” (even of this “unadjusted” data) or from splicing a 1/2 cycle and calling it a trend: Just where is the room for CO2? It took me a few days of “seat time” to make this set and post it, so don’t worry if you just want to look at a few each day over time. After the first dozen even my eyes started to glaze over ;-) But these will be here for months or years to come, for your pondering.